Maury County Public Schools students are finding ways to gain workplace experience through school-organized programs and classes. As part of the seventh key of the “seven keys to college and career readiness,” work-based opportunities are giving students valuable exposure to work environments and helping them as they make decisions about their future. Anna Catherine Shepard, a senior at Columbia Central High School, currently job shadows as a teacher’s assistant at Whitthorne Middle School in comprehensive development classes in the special education department under Rachael Rhinehart. In this position, she helps around the classroom, helps run the PAES lab and works one-on-one with CDC students. Shepard says work-based learning teaches her valuable skills she will take with her in the future. 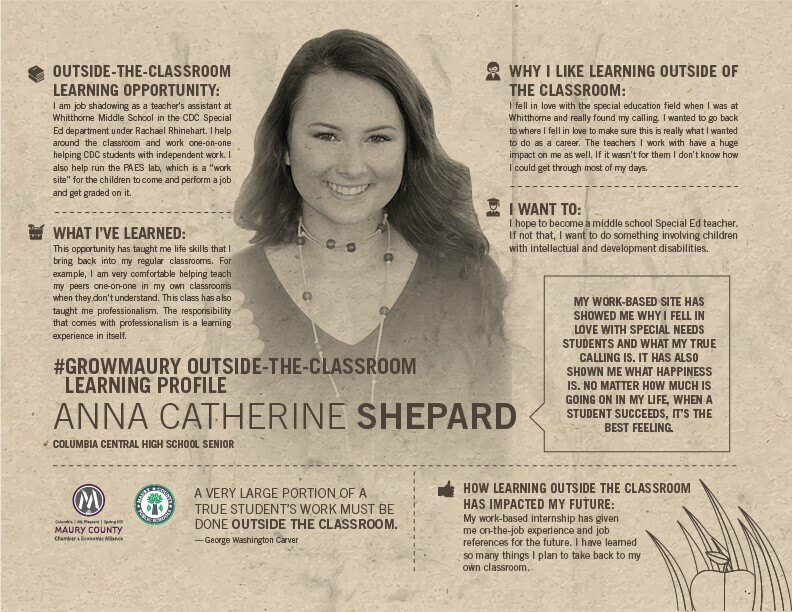 Shepard also learns about what being a teacher looks like day-to-day, giving her a look at what teaching might look like for her as a career. Because of this opportunity, Shepard said she wants to pursue the necessary degrees to become a middle school special education teacher. Shepard isn’t the only student taking advantage of work-based learning sites. MCPS also offers opportunities in fields like criminal justice, retail, manufacturing and more. These courses will continue to help graduates be prepared as they enter college or the workforce. 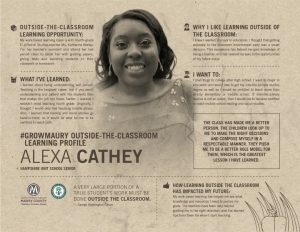 Alexa Cathey, senior at Hampshire Unit School, has also discovered her future career through a work-based learning opportunity. Cathey is currently a teacher’s assistant in Katherine Worley’s fourth-grade ELA/Social Studies classroom during Worley’s final period. Cathey helps with grading papers, giving tests and individually helping students with their classwork. Her experience in Worley’s classroom has solidified Cathey’s decision to pursue a degree and career in education. Cathey said she also has learned workplace skills like the best ways to be understanding and patient with students and how to conduct herself while in a position of authority. Along with learning the ins and outs of being a teacher, Cathey has also learned more about what kind of education she should pursue. Work-based learning is providing students across MCPS with opportunities to learn outside of the traditional classroom setting. By giving students exposure to the workplace early, MCPS hopes students will feel more confident upon graduation in their abilities to succeed in college and the workforce. Students interested in participating in a work-based learning opportunity to contact their school administrators to find out what opportunities are available.